A prolific compact vine that produces single-serving sized winter squash with a very high sugar content - what more could you ask for? It's resistant to powdery mildew too! 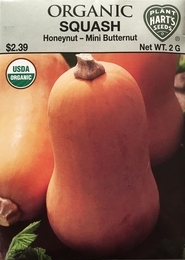 Each 4-5 inch long traditional butternut shaped fruit starts out green, turns buff with green stripes, and fully ripens to a rich caramel color. Plant as early as possible for your area to allow the fruits to fully mature and reach their highest sugar content. Stores well. Developed by Cornell's Vegetable Breeding Institute. Planting time - when soil has warmed to 70 degrees for best germination. Germinates in - 10-14 days depending on the soil and weather conditions. Thinning - to 2-3 plants per hill when seedlings are 4 inches tall.